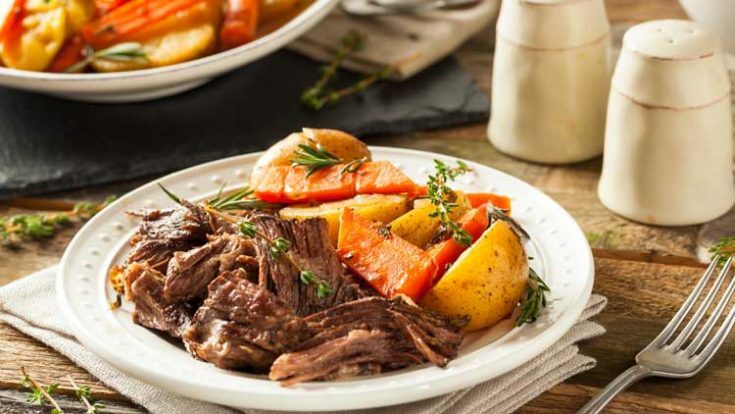 Looking for an easy slow cooker pot roast recipe? You have to try our amazing roast beef! Call it roast beef or pot roast, this one is tried and true and has been tested over and over again. I grew up watching my Mom make this delicious slow-cooked Pot Roast and have been making it on my own for the last eighteen years. It only takes a few ingredients, and you can always change it up and use inexpensive sale steaks if you’re looking for a way to scrimp on your grocery budget. We love to cook slow cooker recipes. It’s so easy to toss ingredients into one pot, turn a knob or push a few buttons, and know that dinner is going to be ready and waiting for you at the end of a hard day of work. 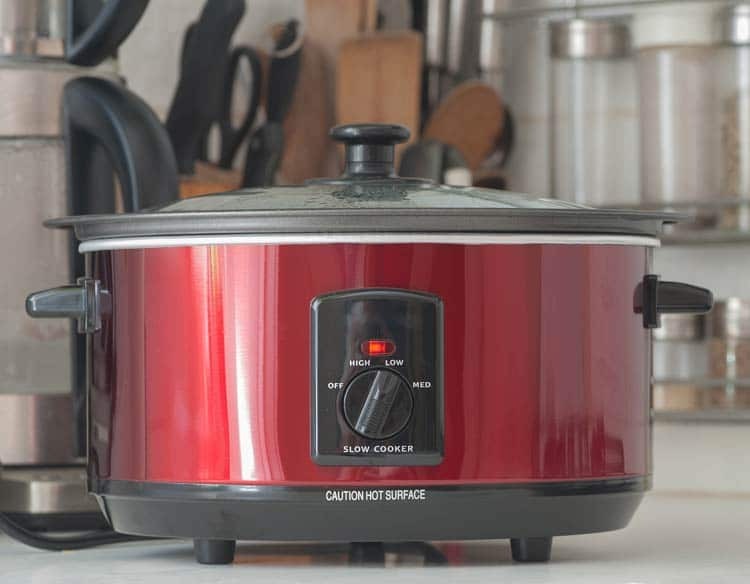 A good slow cooker is an essential small kitchen appliance to have on hand. We have a few slow cookers at home, and they all get some good use out of them. One of our favorites is typically reserved for entertaining. It’s a 3 in 1 slow cooker, which is the perfect combo for making a few hot dips or serving up small portions of a couple types of chili. Some of our absolute favorite slow cooker meals: Zuppa Toscana, Texas Chili, and Creamy Chicken Tacos. Seriously, we could cook in a slow cooker or Instant Pot almost every night of the week. The ease and convenience of slow cooker cooking cannot be beat. This Crockpot roast beef recipe is an easy recipe that has been in our family for years. 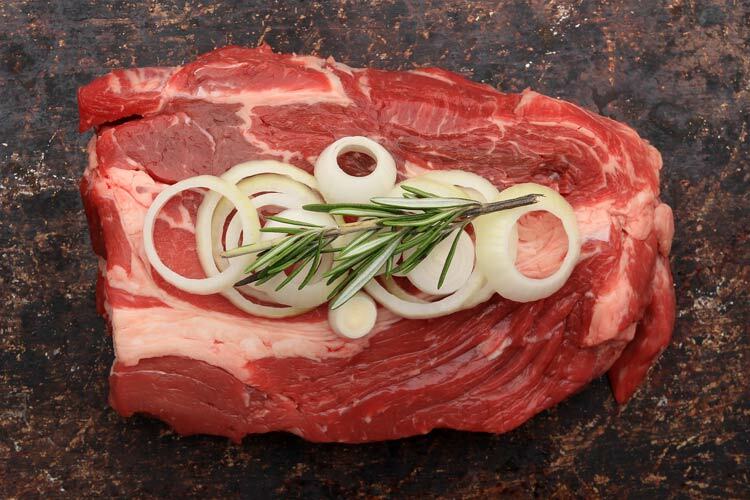 It is so quick and simple that we really should think about making pot roast more often! And the leftovers are always phenomenal! This slow cooker pot roast is amazing. It is seriously one of the best slow cooker recipes we’ve ever made. And if you happen to be at home during the day, working or otherwise, the scent of flavors melding together totally wafts through the air. When you breathe that in, you’ll totally get why this is one of the best meals in the world. It’s a comfort food favorite, and for good reason. Our favorite vegetable ingredients to add to a slow cooker pot roast are root vegetables. Toss in some potatoes and carrots, maybe and onion for added flavor, and that’s just about all you need. And the veggies–they might even turn out to be your absolute favorite part of this delicious recipe. Your choice of vegetables, equaling at least 3 cups. The more you add, the more you have. Sometimes I use a bag of frozen stew vegetables if that’s what I have on hand. You could also use cubed potatoes, chunks of carrots, onions, and peppers. They are all delicious. Place roast on the bottom of crock pot (we like this programmable Crock Pot because you can set it, cook dinner and have it set to keep warm for when you get home) and pour undiluted soup over the top of the meat. Toss in your choice of vegetables. Set temperature on low and cook for 8 hours. 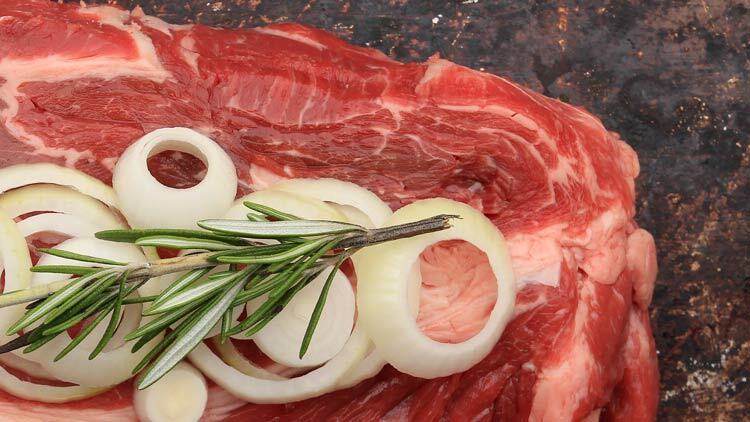 I always start my pot roast in the morning and let it slow cook all day long. This is the perfect meal for when you don’t have time to fuss with dinner, but want a hearty and fulfilling meal. 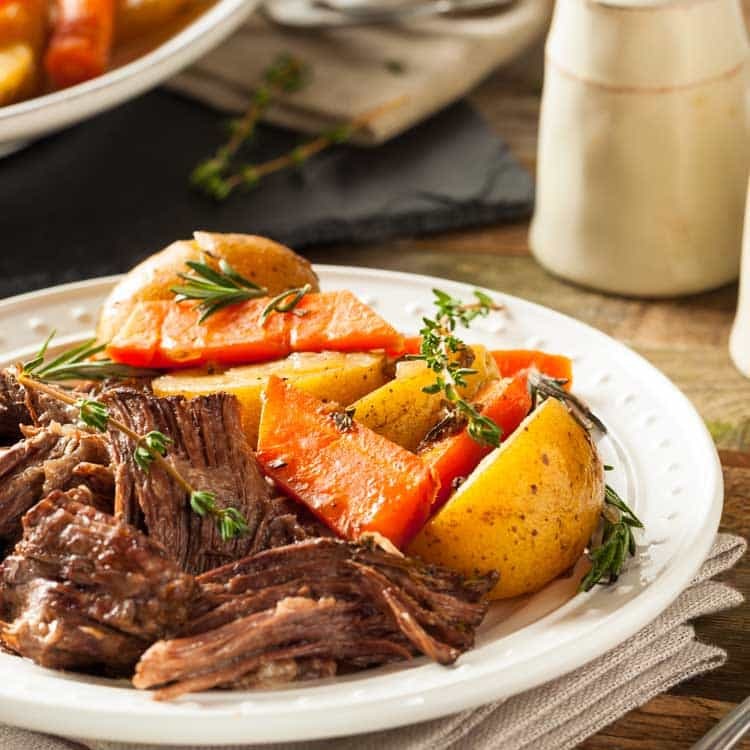 This easy pot roast recipe is SO delicious, and using just a few ingredients. Golden mushroom soup adds just the right amount of flavor to compliment the juices from the vegetables and beef. As far as the vegetables used, we typically toss in root vegetables including potatoes, carrots, and then add in a roughly chopped onion. Occasionally we’ll add in chunks of bell pepper. Place roast on the bottom of crock pot and pour undiluted soup over the top of the meat. Toss in your choice of vegetables. Set temperature on low and cook for 8 hours. I always start my pot roast in the morning and let it slow cook all day long. This is the perfect meal for when you don’t have time to fuss with dinner, but want a hearty and fulfilling meal.